An Asian expatriate job seeker who came to Dubai empty handed now employs over 2,500 people. Within four decades, he has not only made a fortune, but is also giving back to the poor and needy. Keshavan Muraleedharan was brought to the UAE in 1976 by his brother Viswambaran to work as a clerk at KM Bhatia Brothers National LLC. His initial salary was Dh1,200. Today, Muraleedharan is an established businessman, who owns a chain of restaurants and branded fast food outlets, and a philanthropist. Speaking of his journey, Muraleedharan says his first attempt at setting up a cafeteria was not a success as he had to close it down in two years because the building did not renew lease of non-branded outlets. But that was also an eye-opener for the new businessman as he set out to learn about branded fast-food chains, and in time he was to open SFC Group of Companies. “I joined as a clerk and then was promoted to work in sales in Dubai, Sharjah and Ajman. I got a major break when the Lebanese sales manager of Abu Dhabi went on long leave for his honeymoon. Despite skepticism from many, I was given charge of Abu Dhabi region. I was drawing about only half the salary of the Lebanese sales manager then. 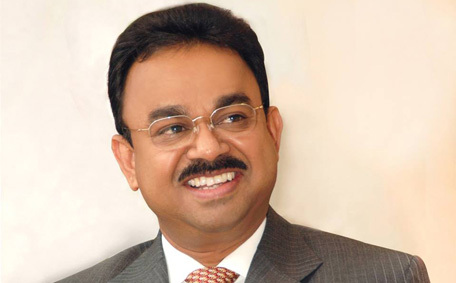 I worked hard and doubled the sales of the group in Abu Dhabi within a few months and soon started getting a share of the profit as incentive,” recalls Muraleedharan. “However, when I started earning more than the most senior staff in the firm, the finance manager started curtailing my incentives. That’s when I started thinking of starting my own business. Meanwhile, taking into account my track record in sales in UAE and Oman, and my interest in starting my own business, I was offered 20 per cent share in the company as Managing Partner - a position that I continued in until 2002,” says Muraleedharan. It was a pure chance that he ran into a British businessman from the franchise firm, Southern Fried Chicken (SFC) during an international food exhibition in Dubai. Today, the group has 30 SFC outlets in different emirates and plans to add another 25 in four years. “Meanwhile, I was also keen on having a good Indian restaurant. So, I travelled all across India to learn about food habits and set up India Palace Restaurant in Abu Dhabi, which is today frequented by not only Indians, but Arabs and other nationals. After the Abu Dhabi outlet was a success, I started the second outlet in Dubai. One of the outlets is in Downtown,” he says. The fourth among seven siblings, Muraleedharan, who hails from Kollam district in Kerala, India, runs several charity initiatives in his hometown to help poor people. “Earlier, when I went on vacation from Dubai, a lot of villagers approached me requesting help. I initially gave them money. Then I started distributing 5kgs of rice to 100 poor families every month and later increased it to 10kgs. This scheme continued for about 19 years until the government started giving rice at Rs1 per kg. I stopped giving free rice because people could afford to buy it. “Then, I started an old-age pension scheme for 300 villagers. I distribute between Rs300 and Rs2,500, depending on their requirement and financial need. There are 19 wards in my panchayat and the beneficiaries are selected from each ward. Only those aged above 60 is considered or the pension,” Muraleedharan explained. He also runs three old-age homes in his home town. He adopts and helps meritorious poor students through his charitable trust - Muraleeya Foundation, which also conducts free weddings and meets medical expense of poor people.